Attention, students! It's time for a pop quiz... and NOT the good kind. 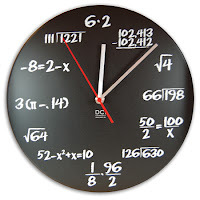 I have issues with this math clock - clearly. I should really "rate it" because it's just so clever, but my fear and avoidance of all things mathematics urges me to "hate it."